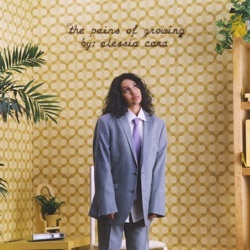 The Pains Of Growing is the second studio album by Alessia Cara, released by UMG on November 30, 2018. The album isn’t a revelation but it has the tinge of a project made with love and devotion, a feeling that had more or less evaporated from Cara’s music. This album really is an honest and truthful affair which will have you feeling like you know a whole new side to her. It may not have that instant bite of her initial LP but 'The Pains Of Growing' sees her emerge from her insecure shell of self-doubt with far more maturity and confidence throughout. Pleasingly, this follow-up gives the now 22-year-old’s voice more power and presence, although it’s still not clear if she needs a USP answer to Rihanna’s Caribbean croak, or Sheeran’s studied guilelessness, to become a superstar. This is a well-crafted, endearing follow-up for Cara that truly impresses. The Pains of Growing presents the thrills and downsides of being a young adult with perceptive honesty. She can be an excessively earnest presence (“There’s truth in every word I write,” she sings, a clear case of telling not showing), yet the songs are solidly constructed and have enough contemporary touches to keep the sepia at bay, like the lilting electronic rhythms in “Trust My Lonely”. While Cara is brave to bare her soul with such rawness– and it feels like a genuine attempt to connect with listeners – she encounters some trouble communicating musically. On the evidence of this impressive and winningly authentic second album, Cara is increasingly unforgettable. While the constant emotional drama sketched out here suggests her innocence is long gone, there is still plenty of maturing left to do. It’s no masterpiece, but more often than not, it works. Cara’s lyricism is sharp and self-aware enough to elevate The Pains of Growing above any strains of monotony. On her excellent second album, The Pains of Growing, Cara really comes of age as a major voice of young-adult disenchantment. An album most appealing in its straightforward sincerity. As a corrective, Cara offers up her own candid gawkiness in tidily constructed pop, and even her near-misses are endearing. The Pains of Growing, while artfully crafted and diverse, is also approachable and familiar. Amazing! 😁 I already know this whole albums gonna be a bop!